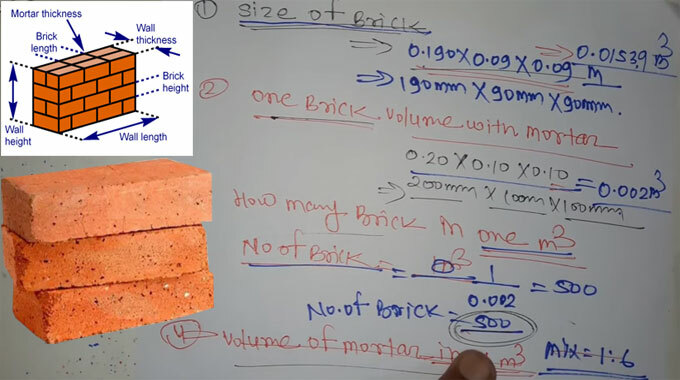 This construction video introduces detailed process for finding out the quantities of bricks as well as quantities of mortar in one cubic meter. Usually, 500 standard size first class bricks are required to build one meter cube of brick work. But it is dependent on the size of brick you prefer. The following two types of brickworks are found in a building. Brickwork in Clay: This type of brickwork contains wet clay for assembling the bricks. The clay should be organized with acceptable amount of sand. The density of clay/earth mortar is 12 mm and the maximum height of building built up with clay is constrained to 2.5 m.
2. Brick work in Cement or Lime Mortar: This type of Brick work contains cement or lime mortar. Cement mortar comprises of Cement and sand having water in exact ratios and the lime mortar contains lime and Surkhi with water in proper ratios. The density of the joint in this type of work is maintained not in excess of 10.0 mm. Other materials like stones and cement blocks are also utilized in brick work. Sometimes corners are also made of bricks where it is required to keep the brick open (without plaster). This type of brick work is called “facing brickwork”.